Nicolas Poussin, L'Assomption (The Assumption of the Virgin) (c 1650), oil on canvas, 57 x 40 cm, Musée du Louvre, Paris. Wikimedia Commons. Not available for Kindle or from the iTunes Store; no English translation has been announced. Nicolas Poussin is justly regarded as the founding father of French painting, even though he spent most of his career in Rome. I have already argued in this article my case for him being one of the greatest pioneering landscape painters, but his work was far broader in scope, with many religious, history, and mythology paintings every bit as wonderful as his landscapes. This can only make it the more difficult to come up with a novel idea for the next great Poussin exhibition, marking the 350th anniversary of his death. Although most flock to see his landscapes, there are a lot of paintings from other genres in France, and in the Louvre in particular. An exhibition in which they were central would therefore seem a reasonable proposition. The bizarre twist to this is that instead of taking narrative, say, as their theme, the organisers chose the issue of whether Poussin believed in God. Apparently this question was not just raised by an Englishman, but extraordinarily he managed to convince the French that Poussin was an atheist Stoic, with a libertine frame of mind. Even when the perpetrator of this account, Anthony Blunt, was outed as a Communist spy and stripped of his knighthood, and it was shown that Blunt had suppressed evidence that ran contrary to his argument, common sense was slow to return. So there might still be some who think that this seventeenth century artist – brought up in a deeply Catholic society and working just a stone’s throw away from the Vatican – was really an atheist. 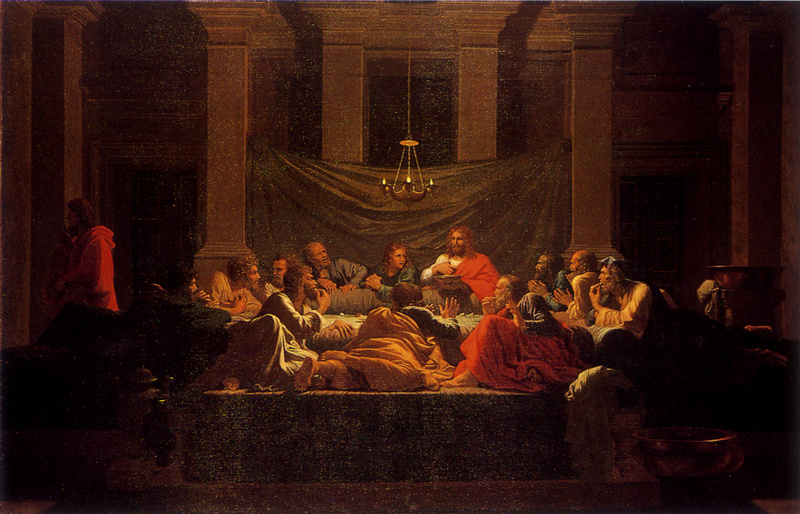 Needless to say, the evidence from Poussin’s paintings is a resounding affirmation that, if he did not say his prayers every night, he certainly made it look that way. 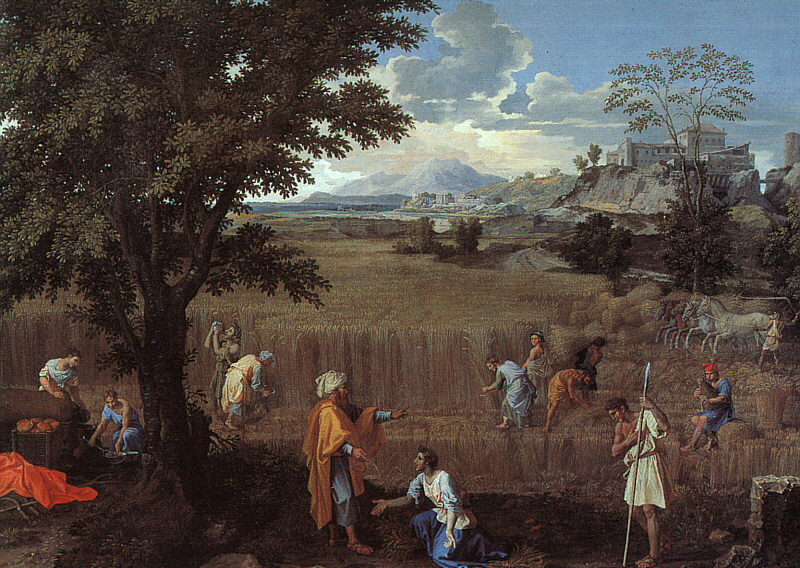 A glance through the catalogue reveals painting after painting depicting classical Christian religious scenes and themes, to say nothing of Poussin’s remarkable series showing the seven sacraments, which he painted not just once (which would surely have given ample credit at the Gates of Heaven) but twice. So whilst I find this debate has worn thin at best, the idea of bringing Poussin’s religious and other narrative paintings together does make sense. The result is a huge and copiously illustrated overview of much of the artist’s life and work, a resource more valuable than anything since the zenith of Anthony Blunt. The book opens with a series of quotations, including an excerpt of a debate between the two main (French) parties, Jacques Thuillier (pro-Blunt) and Marc Fumaroli (anti-Blunt) which was recorded in Le Figaro in 1994. This leads on to a summary of the history of the debate, by the editors, and a presentation of the anti-Blunt case in its historical setting by Fumaroli (Thuillier having died in 2011). This will be of great interest to French historians, I suspect, but I did not even know what Gallicanism was. After that, Szanto dissects some of Poussin’s friendships to the accompaniment of some plates of Poussin’s landscapes, then Milovanovic tackles his exegesis using some details of paintings. Next Keazor examines how best to integrate Poussin’s mythological and other pre-Christian paintings with belief in a Catholic God, showing a correlation which he considers best explained by them being two sides of the same coin. This is a solution compatible with the following essay by Mérot on Poussin’s Graces. Szanto and Buttay open their essay, on Fortune or providence, with greater confidence that by now all thoughts of atheism have been dispelled. Cojannot-Le Blanc progresses this to consideration of the art of the altarpiece, and the visual experience of churches. The next essay, by Cousinié, examines the iconography of The Miracle of Saint Francis Xavier (1641), one of Poussin’s visibly uplifting ‘ascension’ images. Then Bonfait traces ‘the God mask’ through some details, before Jonathan Unglaub writes of Poussin’s portrayals of Saints Peter and Paul. Nicolas Poussin, L’Assomption (The Assumption of the Virgin) (c 1650), oil on canvas, 57 x 40 cm, Musée du Louvre, Paris. Wikimedia Commons. 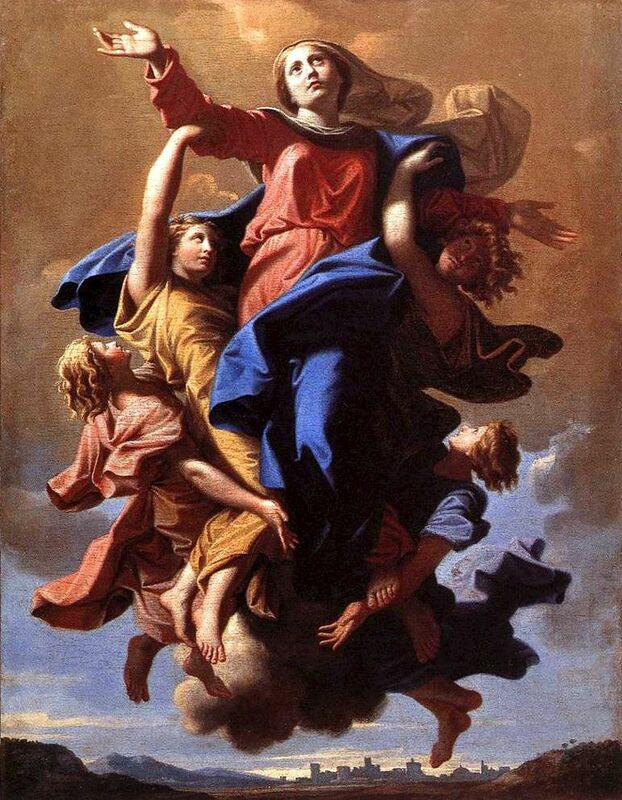 The last two essays are by Stanic, on motherhood, and Nau, on the ancient gods shown in the clouds, which has some wonderful details gathered from various of Poussin’s paintings. These contributions are heavyweight, written by the leading scholars in the field, and will repay more attentive reading and re-reading. After those 150 pages of essays, it would be disappointing to see the paintings dismissed in brief. This book brings no such disappointments, though, with the catalogue carefully divided by thematic section, and many works both illustrated magnificently and discussed at length. The first theme is Poussin and Roman Catholicism, which opens with his self-portrait from the Louvre (1649-50). This has a total of four pages devoted to it, including one full-page reproduction, miniatures of the Berlin self-portrait and two prints derived from them, and two detail views. A total of fourteen wonderful paintings make up this section. The next is devoted to the Holy Family, which includes the Detroit version, in my view one of the most perceptive portraits of a mother and baby until the nineteenth century, and quite unlike Poussin’s other paintings (and those of other Masters). The third theme is of Christian friendship, including the first series of seven sacraments (completed in 1642). Sadly one, Penitence, is now missing as it was destroyed by fire in 1816. There also follows the second series (1644-48), all of which remain in Edinburgh, and are represented in this exhibition by studies from the Louvre and the Royal Collection at Windsor. Nicolas Poussin, L’Eucharistie (Holy Eucharist) (Seven Sacraments II) (1647), oil on canvas, 117 x 178 cm, National Galleries of Scotland, Edinburgh. Wikimedia Commons. Fourth is Fortune, destiny and providence, which includes the Louvre’s enigmatic Shepherds of Arcadia or more popularly known as Et in Arcadia ego. Moses is the subject of the fifth, and Christ that of the sixth. The latter includes the Crucifixion (1646), which remains in the USA and is not exhibited, together with a reconstruction of the preparatory drawing for it. The final theme is sacred landscapes, including those with Saint Matthew, Diogenes, Pyramus and Thisbe, Saint Francis, Orion, and finally the Louvre’s own Four Seasons. Three short technical studies complete the content: a fascinating paper by Ravaud, a shorter piece by Glanville on light and colour, and an even briefer account by Viala of conservation work on The Blind of Jericho. The book concludes with a one-page biographic summary, a huge bibliography, an index of personal names, and one of paintings (and other works of art). I cannot fault this book, even on price, although it would make my reading easier if it were available in English translation. You might struggle to get the most out of the introductory essays, and they are not something amenable to Google Translate, but if you can manage most of the text in the superb catalogue you will still find this of great value. This Poussin exhibition may not have attracted the same publicity as the recent “Late Rembrandt”, but this book is a milestone in art history, and an excellent reference in its own right. If you want a short catalogue to accompany a visit to the exhibition, the Louvre offers one which is cheaper and more basic, and an iPhone app. But take a look at this book, and I think that you will want to buy it. The exhibition Poussin et Dieu is at Musée du Louvre, Paris, until 29 June 2015: details are here. Those who appreciate Poussin cannot afford to miss it. Posted in Painting and tagged art, atheism, Blunt, book, Catholicism, painting, Poussin, review. Bookmark the permalink.